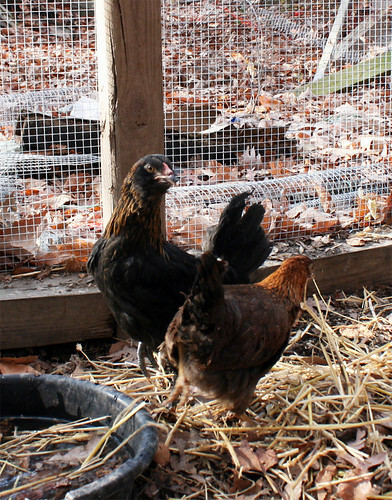 Home / Life at the Manor / Baby chickens! Who wants a couple baby chicken pictures? No one? All right then, I’ll just take these and– what’s that? My gentle readers do want baby chicken pictures? Happily, I have uploaded a couple! The babies got a little time to explore the run with me running interference, but are now safely behind a separate fence where the big chickens cannot persecute them. We’ll see how it goes. I may end up dragging the ex-pen out there to make them a bigger area in the run as they grow. That’s Ayinnanku in back and Bebelina in front. They are tiny at the moment; Ayinnanku is about a third of the size of the adult girls and Bebelina is maybe a quarter of their size. And no, the chicken water does not normally look like that. Here’s a better one of Bebelina, to show off her gorgeous feathers. I took this one after they were moved into their pen-within-a-pen. That’s baby spinach on the ground behind her. Ayinnanku is much flightier than Bebelina and did not wish to pose for pictures in the baby pen. She’ll come around, I’m sure. Since they haven’t grown their combs yet the girls look a little like teeny misshapen hawks, which is adorable. I am tempted to go out there with a leather glove and see if I can convince Bebelina to perch on it, just for fun. 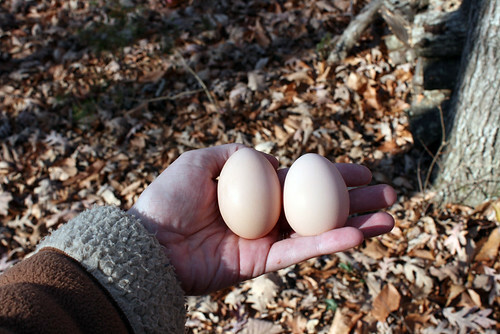 Oh and here’s one of eggs nine and ten that we got Sunday, one from each of the adult hens so you can see the difference! These eggs took us down to a cost of $80/egg, which is very exciting! The one on the left is from Matilda, the one on the right is from Lorena. Matilda, the Australorp, reliably lays a daily egg. 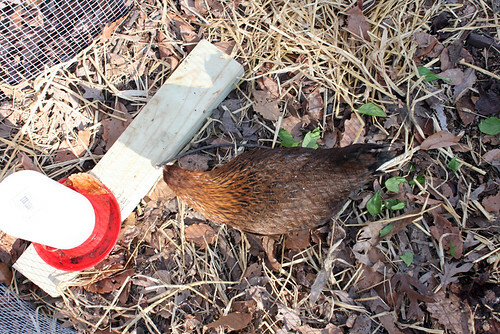 Lorena is a more irregular donor of eggs, which is expected as the days get shorter. Australorps are known for being good layers even in the winter, so we may continue to see eggs from Matilda on a daily basis until she gets old. Lorena will probably pick up more in the spring, round about the time the little girls are getting old enough to lay. We will likely see a dozen eggs every three days this summer, which I suspect is more eggs than we’re going to eat even given my deep love of custards. So if I see you and I hand you a half-dozen oddly colored and shaped eggs, well, please try to understand. I’m pretty sure I have chicken envy now. Did I mention that there’s nothing like a “pet chicken” egg, when it comes to taste? Alas that Virginia isn’t closer to Nebraska! I would make cupcakes for you with your eggs. We got our twelfth egg last night for a round dozen! It was very exciting. I think we’re going to have to start making more quiches, although cupcakes sound better. I totally have chicken envy! There’s a big urban chicken movement here in Los Angeles. I keep bugging Tall Chris about it but know that our lack of space wouldn’t be fair to the chickens and the neighbors. I’ll just continue to live vicariously through my local friends with chickens, Barbara Morrow (her chicken coop is made to look like an Old West town) and you. Hens are pretty quiet, at least until they lay an egg. I refuse to get a rooster because even though I’m out in the country, I like my peace and quiet and my neighbors too much to have a roo around. You can hand me a dozen eggs anytime. Too bad I live so far away. b) I can’t imagine who would do all the work. I’m good with having chickens. Keeping chickens is a whole ‘nother deal. They’re actually second only to the turtle in low-level care! I spend more time sitting with them for enjoyment’s sake than I do performing Required Chicken Care Duties, which take about 5 minutes a day, 30-60 minutes once a week, and then another 30-60 minutes once a month (those last two being for cleaning purposes). On the other hand, neighborhood associations are WAY more of a problem. And I think this summer really is going to be my “randomly handing eggs to people” time. There’s only so many quiches you can eat, you know? Ooh, barter. Do you know any local hunters who have spare organs and meatybones going?